On a Beautiful Sunny April 13th we took part in the Annual Culloden Memorial Service. In 2017 I first became aware of the Clan Chattan Association. Visiting friends near Forres we visited a bookshop with a 2nd hand section on Scottish history. The first thing I picked up was a copy of the Clan Chattan Journal and the opening article by Br Pascal Downs OSB was about my own family, the Macphails. For the first time I saw an account in writing of something I’d only heard about as a child. Namely that we couldn’t go back beyond 1746 because our direct ancestor, a young boy called James Macphail, was found orphaned at the Battle of Culloden. I bought that copy (Vol X11 – No 2 2008) and several others and read about the Association. It spurred me on and I contacted Denise and Donald McIntosh and was told about the Clan Chattan Gathering the following August 2018. My youngest daughter, Emily, offered to accompany me to the meeting. In the interim Emily had moved from the south of England to Edinburgh and we decided to spend a week in the highlands doing family history before and after the Gathering. We went initially to Oban to visit Ardchattan and Eriska where earlier pre1291 generations of Macphails had lived and then via the Great Glen to the MacPhail area south of Inverness and Moy, including Dunlicity church to see the plaque put up in 2000 commemorating the Macphails of Inverarnie. We then attended the AGM and Dinner at Lochardill House Hotel and met many new people. We were made so welcome by Donald and Denise McIntosh and introduced to John Mackfall whose table we joined and where we also met other Mcfalls and Glen Cook from the USA. Everyone was so helpful and to my amazement we realised John Mackfall and I had grown up in the same village in N.Yorkshire and he being much younger than me had known my brother Richard at school. What a small world. Next day we attended the Field Fair at Moy Hall and met more members in the Clan Tent. We were delighted to visit the Mackintosh Museum at Moy Hall and also to buy many books about Clan Chattan and related subjects as well as John Mackfalls book The Clan Phail. The History of a people. Anne Fraser Macquarrie gave me a great boost as she took our family’s details and offered to look up the parents of James Macphail in the archives. We can not attend the 2019 Gathering as we will be away in the Solomon Islands, in the Western Pacific where we used to live but we hope to attend the autumn meeting in Edinburgh and look forward to that meeting. This looks like a fascinating lecture organised by the AHCS I am sure that anyone who is thinking of attending the Culloden Memorial on the Saturday 13th April will want join in. Remember to e-mail Anne highlandclans@aol.com in good time so that she has numbers to give the Hotel. See you there! Please email highlandclans@aol.com to book giving me the names of all in your party. (Nicky Tam’s at the Glen Mhor serves an early dinner between 5-6.30 p.m and this can be booked directly with the hotel). Meet at the visitor centre at about 10.30a.m. to be ready to march to the Cairn. 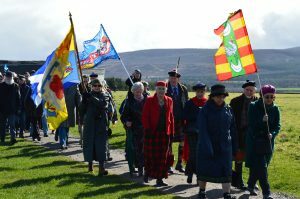 We will be Gathering at the Culloden Visitors Centre to March to the Cairn at 11am. This emotional, yet colourful, ceremony is organised by the Inverness Gaelic Society. It has grown over the years and is now a very popular event. Look out for us on the day. Let us know if you will be coming so that we will look out for you. Get in touch, for Touch Not. 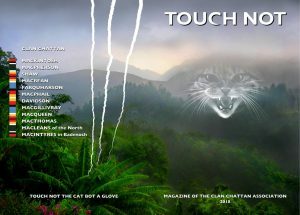 The Touch Not Magazine is the annual publication for the Clan Chattan Association. It includes articles of historic note as well as members’ news. So now is the time to get your article in print. Tell us about your recent trip to Scotland or the family re-union. Have you been researching your ancestors, why not get it printed and tell others about your experience with researching. Or have you been researching a particular Clan Associated event and feel that you could write about it, we want to hear from you. It need not be a long article but should, if possible, come with a few photos or illustrations. 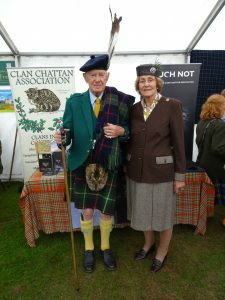 The Clan Chattan Association were represented in the Clan Tent at the Braemar GAmes at the beginning of September 2018. We had a visit from Captain and Lady Farquharson of Invercauld. 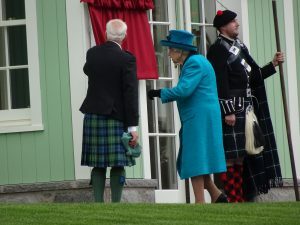 The Queen opened the New visitor centre.